One of the most common requests we receive from our customers is to make their IGI system easy to use. Our expert team of programmers takes a highly complex commercial audio-visual or advanced visualization system and makes it simple enough for a completely inexperienced user to operate the system. Each custom designed graphical user interface (GUI) is displayed on a wall mount or table top touchpanel and located in a convenient location for either an end user or experienced operator to use. 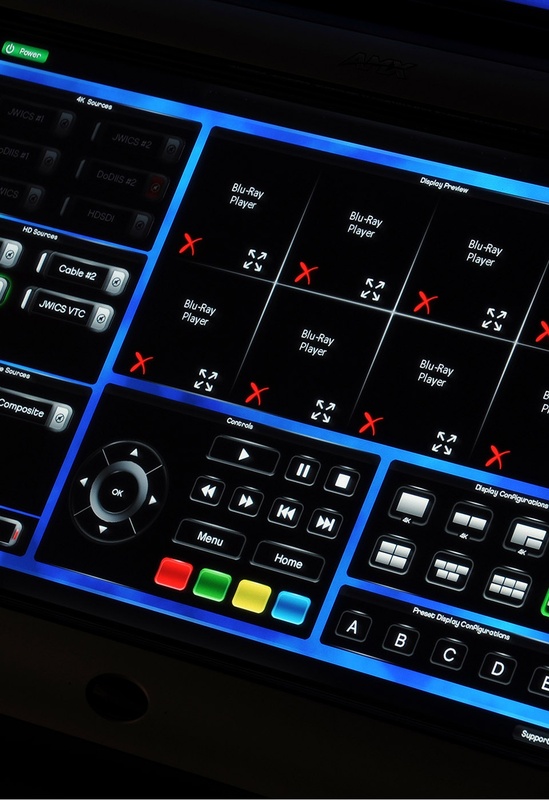 At a touch of a button, sources can be routed to displays, audio systems can be controlled, display configurations can be set, or individual components can be operated. Optional in an IGI advanced visualization system is a large touch screen panel with multi-windowing control capability. This is the means to display multiple video sources on a single display, making the collaboration experience more effective. An advanced multi-touch panel allows the user to resize and move these windows across the display simply by touching and dragging, similar to a smart phone or tablet computer.